Learn more abut the online B.B.A. in Cyber Security. (April 4, 2017) -- In the fall of 2017, The University of Texas at San Antonio (UTSA) will begin offering its first fully online degree program, which will allow students to earn a B.B.A. in cybersecurity through the internet. The Ponemon Institute has previously ranked UTSA's overall cybersecurity programs No. 1 in the nation, based on a survey of IT executives, and the university's academic and research programs are recognized for excellence by the National Security Agency (NSA) and the Department of Homeland Security (DHS). "The College of Business is proud to support UTSA's online initiatives by offering our cybersecurity degree program in this innovative format," said Wm. Gerard Sanders, dean and Bodenstedt Chair of the UTSA College of Business. "It will allow us to create a professional pathway for even more students into this burgeoning job market." Students in the online degree program will have access to the same vast cybersecurity expertise that UTSA students currently experience on-campus. Students will also earn badges and micro-certificates along the way, providing additional relevance to the job market. "Cybersecurity is an industry where well-trained professionals with relevant experience are high in-demand," said Yoris Au, chair of the UTSA Department of Information Systems and Cyber Security. "This program will also give them the business expertise they need to succeed in their professions." Au noted that graduates of UTSA cybersecurity programs go on to work at security firms as well as government agencies like the NSA, CIA and FBI and for major business corporations such as USAA, Rackspace and H-E-B. "Now students from all over the United States will be able to access these educational opportunities, even if they don't live near San Antonio," he said. Partnering with the University of Texas System's innovation department, the new online degree program is supported by Total Educational Experience (TEx), a web-based learner platform that guides students on personalized journeys throughout their lifetime. "More and more industries are hiring applicants with cyber security skills and knowledge," said Au. "By making our B.B.A. in Cyber Security available online, we will be able to prepare more students and connect them with these in-demand jobs." 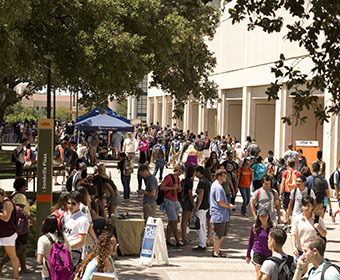 UTSA is ranked among the top 400 universities in the world and among the top 100 in the nation, according to Times Higher Education. Learn more about the online B.B.A. in Cyber Security. Learn more about cybersecurity at UTSA. Learn more about the UTSA Department of Information Systems and Cyber Security.